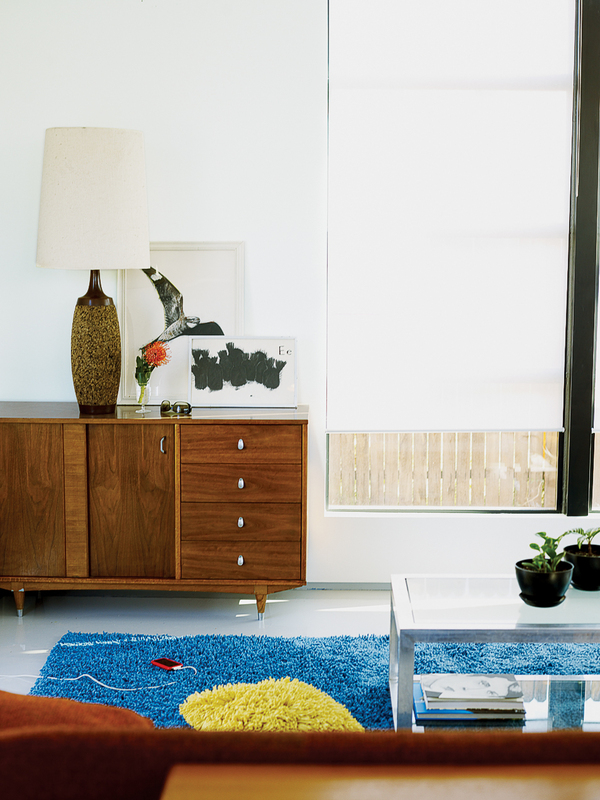 "Dusk is when it really glows," says Aaron Jones of his jewel-like 625 square-foot home. When Aaron Jones decided to build a tiny one-room house on his central Tucson lot, he knew he wanted something minimal, modern, and airy. Something that would stand out in the sea of aging desert bungalows, but that wouldn’t cost an arm and a leg. 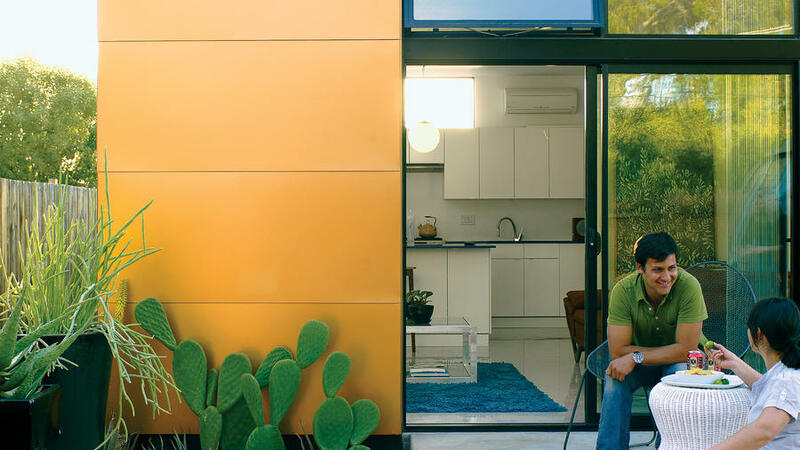 He’d always been curious about prefab homes, and an Internet search led him to architect Rocio Romero, whose eco-conscious modular homes ― particularly the 625-square-foot LVM model ― looked just about perfect. And, since Jones would be the first person anywhere to build this particular model, it was sure to stand out. Because the house is one big room, Jones used furniture to mark living spaces. For $22,050, the LVM kit included plans and the exterior shell and walls of the house, along with siding and a list of suggested finishes from Lowe’s and Ikea. “Basically, it’s the frame of the house,” Jones explains. For Jones, a self-taught carpenter who planned to do much of the work himself, it seemed like the ideal solution: an architect-designed home with enough wiggle room to accommodate his own ideas. He ordered the LVM kit and set about getting the permits. He finally connected with Doug Kassian of Sierra Madre Construction. “He was game to learn, and he was interested in green solutions. I mean, he was a contractor who drove a Prius,” says Jones, laughing. Once the bureaucratic rigmarole was out of the way, the house arrived on a flatbed and Jones and the crew got to work putting it together. Four days later, all that was left to install were the windows and the interior finishes ― flooring, countertops, cabinets ― and the extraordinary copper-colored siding. There were a few minor disasters along the way: the last-minute grading ordered by the city, the mixing mishap with the epoxy flooring (it had to be scraped up and redone), and the windows that were wrongly installed by about 2 inches. But now that the house is finished, they seem like distant memories, funny stories to be told over cold beers on the house’s front patio. 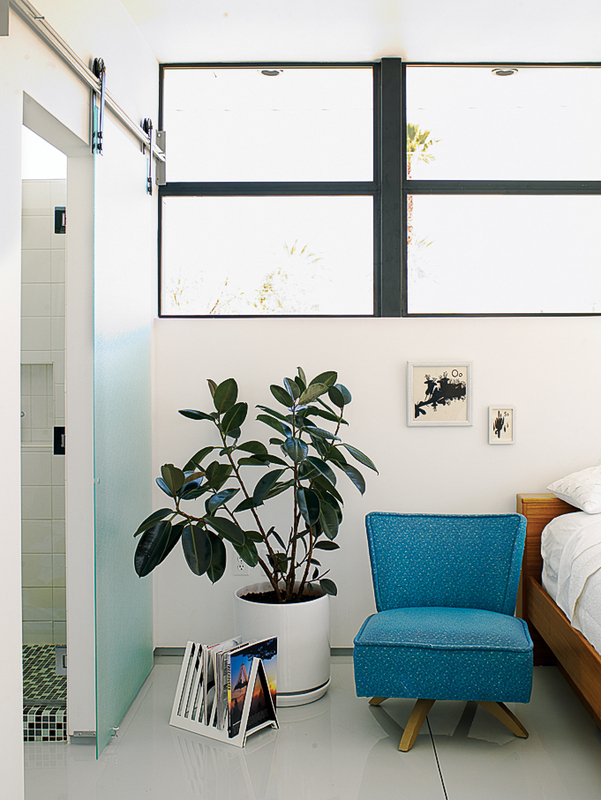 Jones eliminated one window to allow more space for furniture against the wall. 1. Do you love the design and layout of the prefab house you’re considering, or are you just hoping to build something on the cheap? While some prefab designs will save you money, others can end up costing as much or more than traditional construction. The finished house should be something you really want. 2. Does prefab make sense for your building site? Factory-made dwellings work well for remote sites (the kit arrives in one truckload) as well as for flat lots. If your lot needs much grading or foundation work before installation, costs will rise quickly. Also, many subdivisions don’t allow for modular construction. Before committing, check the building restrictions where you live. 3. When choosing a prefab company, make sure the people behind it have, in fact, built a house. This sounds obvious, but there are many designers with eye-catching plans and prototypes but no real experience. Choose from a menu of components (walls, cabinets, rooms, and built-ins) to piece together a complete house. A pioneer in modern, green prefab design, including the mkLoft (a two-story dwelling with two bedrooms and foam insulation) and the butterfly-roofed Sunset Breezehouse. Prefab structures that are ideal for use as stand-alone guesthouses, home offices, or studios. The company designed this year’s Sunset Idea House, the Modern Cottage. Eco-conscious Jennifer Siegal, OMB principal, designs modular buildings that focus on indoor-outdoor living. Her houses are clean-lined and energy-efficient; ideal for those interested in designing or choosing their own finishes.